Founded in Brazil in 1986, Pro-Natura was one of the first Non-Governmental Organisations from the South to become truly international; after the 1992 Rio Summit, Pro-Natura International located its headquarters in Paris with the focus on fighting poverty together with biodiversity conservation and climate change mitigation. One of the main developments under this programme was “green charcoal”, a biomass charcoal produced through clean pyrolysis from renewable “waste” biomass (biomass not used to feed animals or enrich the soil such as rice husks, invasive weeds). The primary reason why Pro-Natura International started working on green charcoal was deforestation. With increased deforestation, wood was becoming harder and harder to find in Africa, Latin America, and Asia and there was a lack of alternative energies. In addition to deforestation, use of wood as a domestic fuel also presents other major disadvantages such as the time and potential security burden on women and children to travel to collect firewood, and the harmful emissions released from indoor air pollution by burning of wood. The green charcoal briquettes as a domestic energy solution alternative to firewood or wood charcoal can be part of an energy answer for rural households in developing countries. In 2002, the pyrolyzer machine ”Pyro” developed by Pro-Natura to produce green charcoal was awarded first prize for technological innovation by the ALTRAN Foundation which recognized the potential of green charcoal to decrease pressures on forests in Africa, especially in Senegal where the first pyrolysis unit Pyro-6F was installed and became operational in 2008. The next generation of that unit, the Pyro-7 machine, can produce up to five tons of biochar a day. Biomass flows continuously through a retort heated at 550°C in the absence of oxygen. The temperature of the retort is maintained by the combustion of the pyrolysis gases that are recycled and burned in a second post-combustion chamber, thus avoiding the release of greenhouse and toxic gases in the atmosphere. One of the highlights of the unit is that once the machine is preheated, the process produces its own energy, except for the transfer of the biomass, which is done by a small low-energy consumption electric motor. Through the use of the efficient pyrolyzer, CH4 emissions from traditional carbonization are eliminated and the yield of carbonization is significantly increased (35 to 45%) compared to traditional production methods (10 to 15%), helping to use less fuel. Additionally, the unit produces heat between 120 and 150 kW which can be used to preheat a second reactor, heat a dryer for feedstock, or heat a greenhouse or other facilities. The green charcoal produced was at first mainly transformed by compression into briquettes for use as domestic fuel. The production of briquettes requires a binder (e.g. starch, Arabic gum, molasses or clay) to mix with the carbonized biomass which is then passed into a dryer to eliminate the water, so that the output briquettes are ready to be used in domestic ovens and cooking devices. However, the potential of the green charcoal powder to be used as a biochar soil amendment was recognized and in 2008, Pro-Natura launched a biochar pilot project on its main green charcoal production site at Ross Bethio in Senegal. 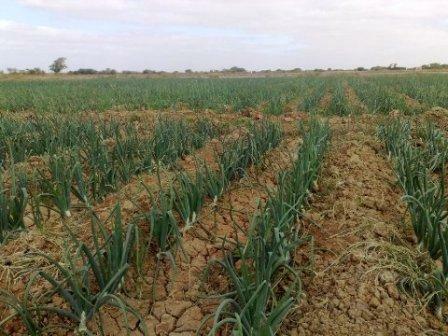 The project provides biochar, training, and financial incentives to local farmers in order to facilitate the adoption of new sustainable agricultural practices based on biochar and organic fertilizers. Besides the direct benefits for the farmers, these trials also contribute to the scientific research on the effects of biochar on crop yields. While the first trials on vegetables already show very encouraging results, Pro-Natura is currently extending these trials to rice fields on a larger scale. The first results and analysis should be announced at the end of 2009. 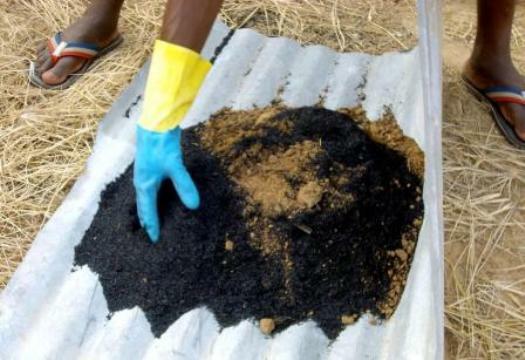 While the reduction of greenhouse gases (GHG) emissions generated by the use of green charcoal as domestic fuel has already been accounted for in carbon credits validated on the voluntary market, Pro-Natura is now working to validate carbon credits for any carbon sequestered through green charcoal used as biochar in soils. Selling these carbon credits has the potential of providing an additional source of revenues that could help replicate and extend this sustainable approach further in other regions of developing countries. Every ton of biomass used as feedstock for the production of green charcoal avoids the emission of GHG equivalent to 0.06 kg of CO2 due to brush burning of unused biomass. Additionally, Pro-Natura has been working with Air France, through the intermediary of the Action Carbone programme of the NGO www.GoodPlanet.org, to offer Air France passengers the option to compensate their CO2 emissions with carbon credits generated primarily by the Pro-Natura green charcoal project in Senegal. For more information on this project see: www.actioncarbone.org.